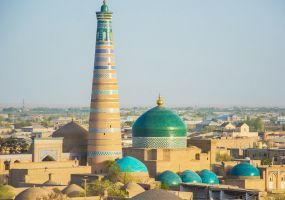 Fascinating cultural and informative tour will introduce you to the ancient history and culture of Uzbekistan, the world famous ancient monuments of Samarkand, Bukhara and Khiva. These cities still keep a memory of Alexander the Great, Genghis Khan, numerous trade caravans of the Great Silk Road. Here the heart was pulsating with the cultural life of a powerful empire of Tamerlane. Tall and elegant minarets, grandiose madrassahs and mosques, medieval palaces and mausoleums decorated with stunning ceramic ornaments, bustle and colors of oriental bazaars, fabulous legends, warm hospitality and ancient traditions of the local people will leave a lasting impression in the memory of tourists. Excursion around Tashkent: the old town, the architectural and religious complex Hast - Imam (Hazret - Imam), with a grand Friday mosque, the medieval mausoleum Kaffal Shashi (XVI c.), Barak - Khan and Kukaldosh (XVI-XVII c), Islamic University library in the mosque Thiel - Sheikh with one of their original Koran of Caliph Uthman (VII century), the oldest in the world; square "Istiqlol" with Madrassah Abdul Kasim XVI-XVII (here are now working and selling their original products and souvenirs artisans), a monument to Alisher Navoi; square of Amir Temur (Tamerlane), a park, an equestrian statue of Tamerlane, surrounded by historical and administrative buildings - Palace of Forums, museum of Temurids , Tashkent chimes, etc. ; monument "Courage" - a monument to victims of the devastating 1966 earthquake in Tashkent; Opera and Ballet Theatre, built by Japanese prisoners of war in 1945, and the light and music fountain; Independence Square (Independence) with the monument of Independence Arch "Ezgulik" eternal fire, fountains; Oriental Bazaar Chorsu, museum of arts and crafts with a rich collection of products craftsmen of Uzbekistan. After lunch, drive to Samarkand (350 km, ~ 5 h). Hotel. 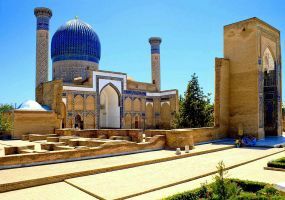 Tour in Samarkand: The "heart" of Samarkand - Registan Square (XIV-XVI centuries) with 3 famous madrasa: Dor, Ulugbek and Tilla-Kori, grand Mosque of Bibi Khanum (XV c.), Gorgeous Gur-Emir mausoleum (XV c.), where Tamerlan, his sons and grandson Ulugbek are buried. 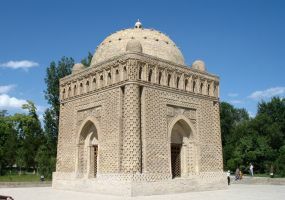 Ulugbek Observatory (1420) - the grandson of Tamerlane, famous ruler and scientist-astronomer, Shahi Zinda (XI-XVIII c.) - Necropolis of Samarkand rulers and noblemen, consisting of set of superb decorated mausoleums, exotic Siab bazaar. Transfer to Bukhara (300 km, 5 hours.). 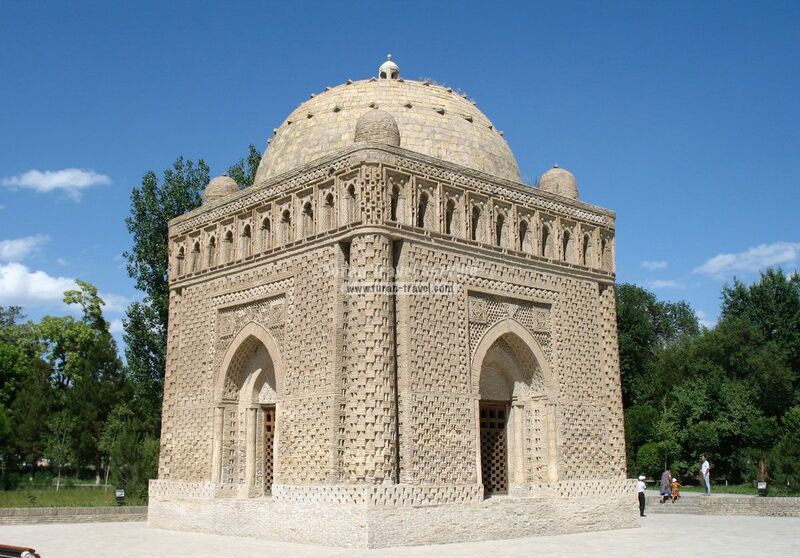 Sightseeing tour in Bukhara: Tomb of Chashma Ayub Mazar (XIV - XIX centuries), complex Poi Kalyan (XII-XVI centuries), Miri-Arab (XVI c.), Labi-Hauz complex (XVI-XVII). 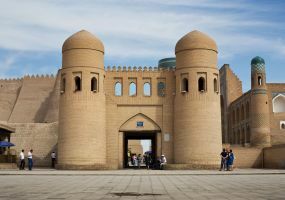 Continue tour in Bukhara: Samanids mausoleum (IX - X centuries), madrasas Nadirdevanbegi (1622), The Ark (VI-VII centuries) - the citadel, where the ancient Bukhara started, Chor-Minor minaret (eighteenth century). ) 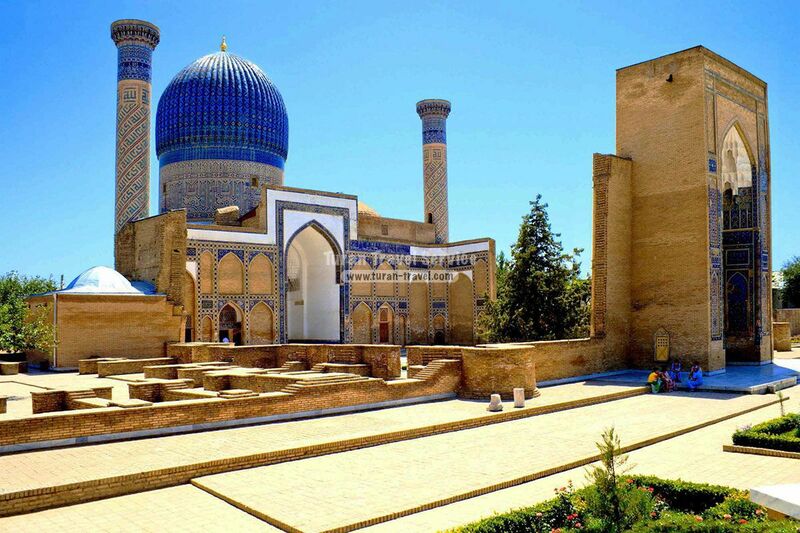 Sitorai Khosa - "Palace of the Moon and the Stars" - the summer residence of the last Emir of Bukhara (XIX c.). 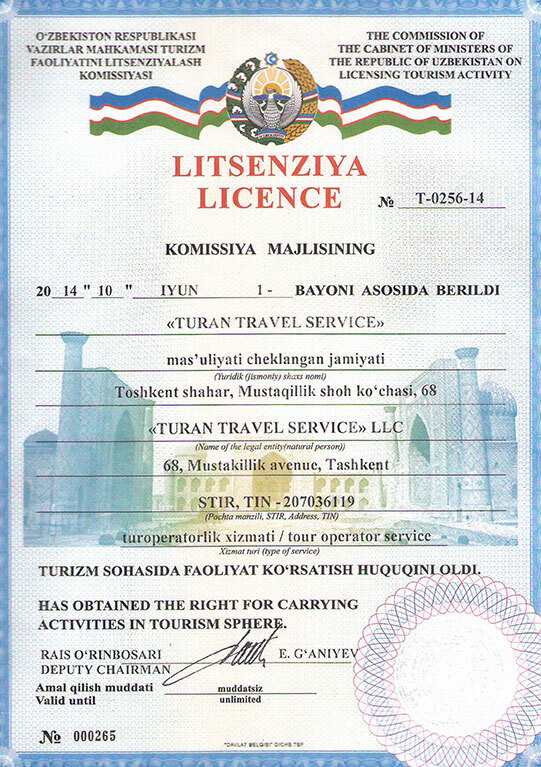 Transfer to Khiva through the Kyzyl-Kum desert (500 km, ~ 8 hours). On the road trip across the desert and on the shore of the largest rivers of Central Asia, the Amu Darya. Accommodation at the hotel. Rest. City sightseeing: Ichan Kala - a town-museum in the open air, protected by UNESCO, minaret Kalta Minor (XIX c.), The Ark Kun (XVII century.) 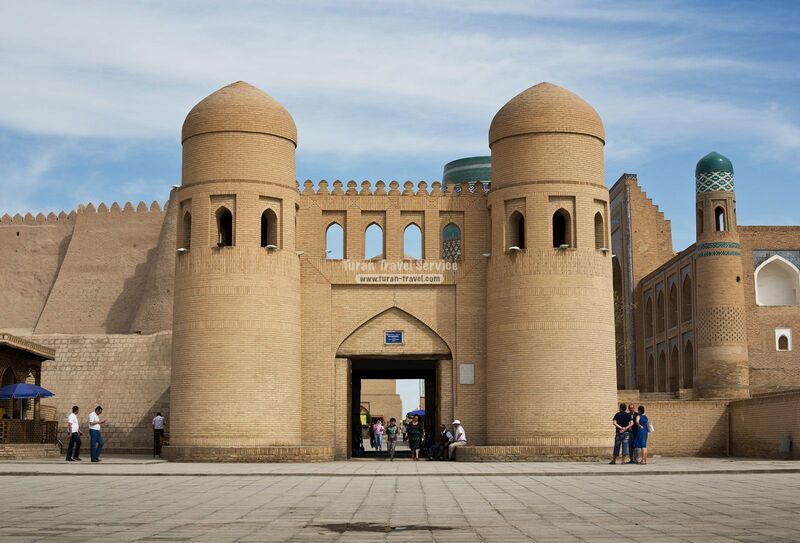 - The former residence of Khiva khans, complex Pahlawan Mahmud (XIV-XIX iv) - a folk hero and poet, minaret and madrassah Islam Hodge (1908. 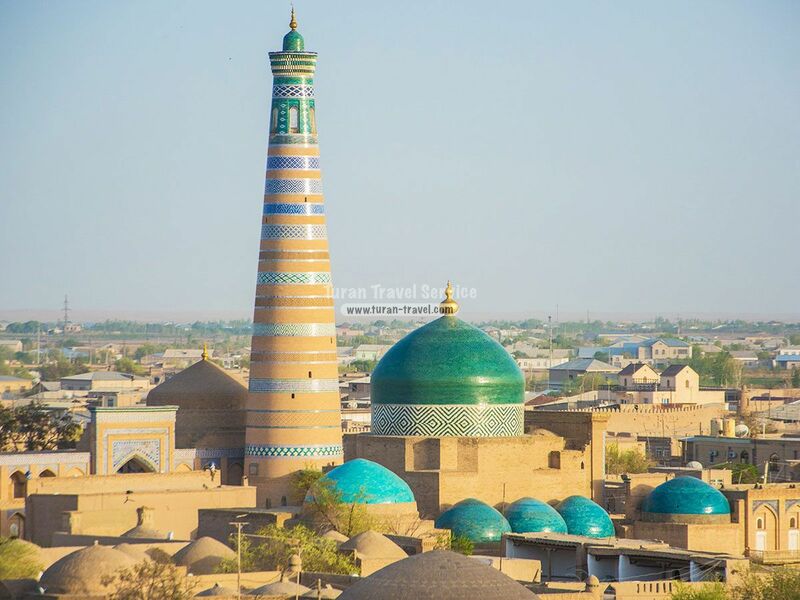 ), Juma mosque (X-XVIII centuries), palaces Tash Hawley Allakuli Khan (XVIII-XIX centuries), the bazaar where you can buy the world famous Khiva carpets. In the evening transfer to the airport. Flight to Tashkent, transfer to the hotel. 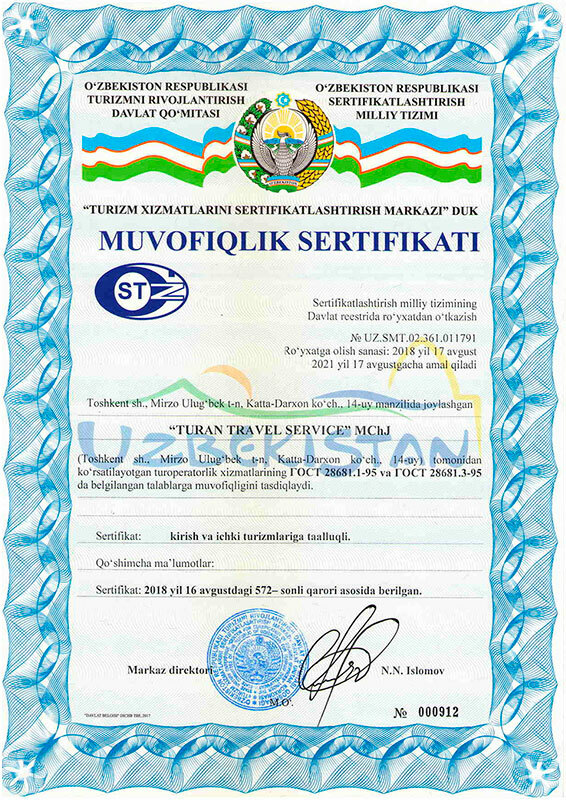 Transfer to the airport for flight from Tashkent. Water for days crossings between cities.